When it comes to big pharmaceutical companies, there look to be few things more alluring than new treatments for cancer, according to analysts who follow drug tests closely. Tuesday’s lineup of earnings reports features Eli Lilly and Co (NYSE: LLY) and Merck & Co., Inc. (NYSE: MRK), which open the books on Q3 results ahead of the market open. Both have a cabinet full of drug medications but few products have generated more attention this year than their treatments for lung cancer and sarcoma. Some have fared better than others, and analysts say they want some insight into what’s ahead. LLY has a pipeline of drugs that apparently offer promise not only to those who need it, but to investors as well. For example, its Alzheimer’s drug, Solanezumab, is high risk but still has potential, according to a Goldman Sachs analyst. 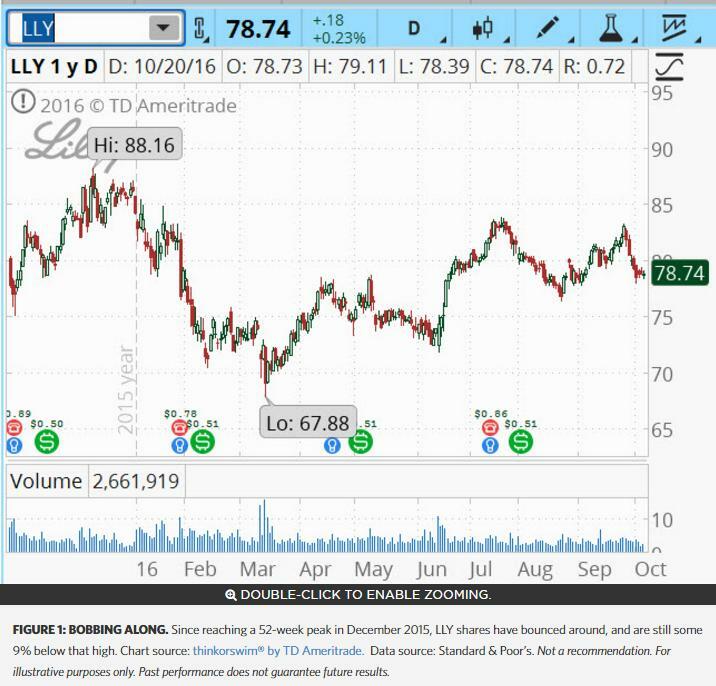 “We believe LLY is entering a long-lasting period of accelerating revenue and EPS growth, driven by a diversified late-stage pipeline propelling many years of margin expansion," analyst Jami Rubin wrote in a note to clients. On October 20, LLY announced a new entrant to the lineup. Lartruvo, an injectable treatment for soft-tissue sarcoma, was the first new drug to win FDA approval for this type of cancer in 40 years. How and when will the company market and distribute? Analysts say they will be listening to LLY’s guidance and insight on what’s ahead in a market eager for new cancer drugs, amid fierce competition for market share. Analysts polled by Thomson Reuters are looking for an uptick in earnings for the first time in four quarters with a per-share profit of $0.96 and top-line sales of $5.3 billion. Short-term options traders have priced in a potential share price move of 3% in either direction around the earnings release, according to the Market Maker Move™ indicator on the thinkorswim® platform from TD Ameritrade. MRK v. BMY: What’s the Score? MRK and Bristol-Myers Squibb Co (NYSE: BMY) have spent most of the last two years in what analysts have called a two-horse race to develop the most effective first-line immuno-therapy treatment for lung cancer, still the leading cause of death in the U.S. versus any other form of the disease. In August, BMY said its cancer drug Opdivo had failed to meet certain goals, giving MRK’s Keytruda a leg up. MRK’s shares soared; BMY’s plunged. At a major European conference earlier this month, the two big pharma companies offered a deeper look into their testing results. Though BMY’s bomb was a boon to MRK, Opdivo sales far exceeded those of Keytruda. Where are things now? That’s just a sliver of what analysts say they want to hear more about when MRK reports Q3 results. There is a host of other drugs—diabetes treatments Januvia and Janumet, and Hepatitis C drug Zepatier, for example—on which analysts are awaiting more information as MRK struggles to reverse a string of declining or flat revenues. Analysts reporting to Thomson Reuters are projecting that revenues of $10.2 billion will be slightly higher in a year-over-year comparison, and will mark the first advance in 16 quarters. On the earnings front, they’re anticipating $0.99 a per-share, $0.04 ahead of the year-ago results. Short-term options traders have priced in a potential 2.75% share price move in either direction around the earnings release, according to the Market Maker Move™ indicator. 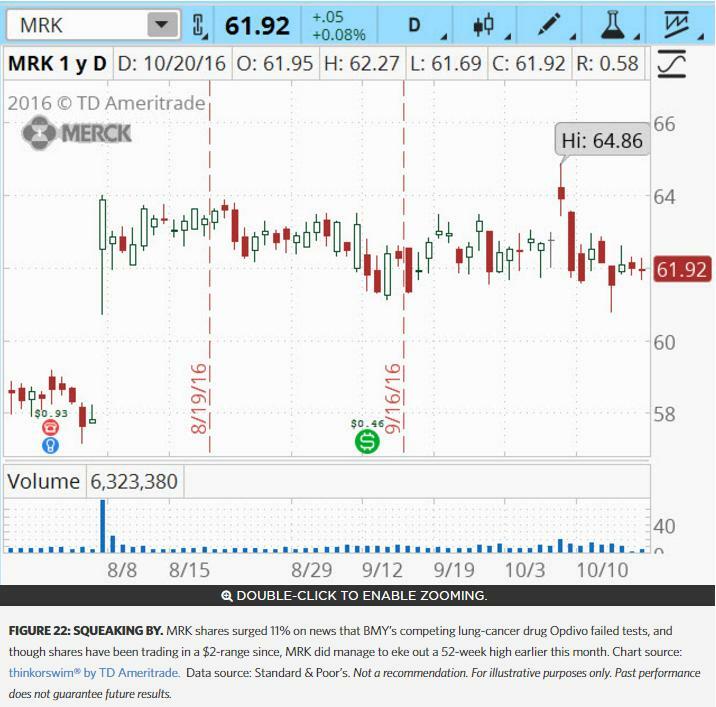 Like LLY, shares of MRK have not seen significant short-term options plays, but there was a notable buy of the 65-strike calls shortly after the stock reached a fresh 52-week high Oct. 10. There has been a smattering of monthly put buys at the 57.5- and 60-strikes. The implied volatility is at the 35th percentile. TD Ameritrade, Inc., member FINRA/SIPC. TD Ameritrade is a trademark jointly owned by TD Ameritrade IP Company, Inc. and The Toronto-Dominion Bank. © 2016 TD Ameritrade IP Company, Inc. All rights reserved. Used with permission.